With global economic perceptions finally creeping toward financial perceptions (not stocks) despite the enormous and mostly ongoing “stimulus” almost everywhere, it is useful to review once more the assumed general mechanisms. Step 1 is really the most basic and traditional element of central banking, as liquidity, broadly speaking here, is currency elasticity in its more modern format. Increasing liquidity is supposed to lead to Step 2, more credit/debt. Step 2 flows to Step 3, which is (hopefully) the bulk of that debt “creating” some real economy “demand.” Step 4 is where spending (demand), even if concentrated in certain parts of the economy (redistribution), leads to more jobs and productive investment which broadens out (“trickle out”) the redistributionary flow to the rest. 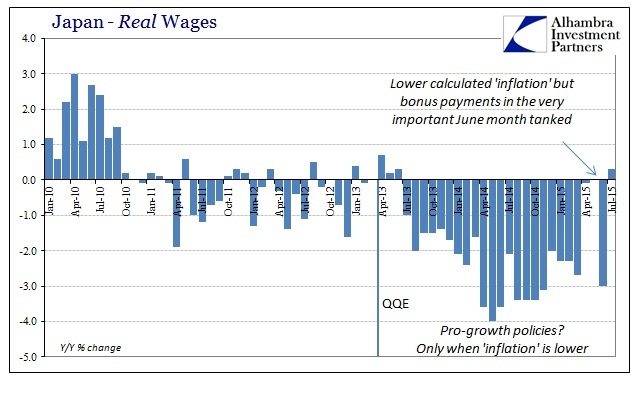 Real wages in July (the latest figures) were positive for the first time in more than two years – but only because “inflation”, one of the primary economic factors from Step 1 that is supposed to help transmit economic growth, has done the opposite as expected and intended. 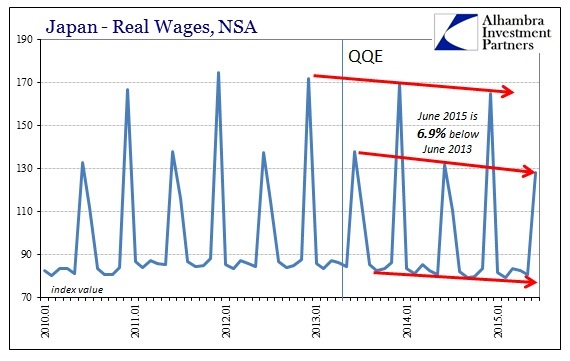 But that “inflation” calculation obscures somewhat the damage already done by QQE since June real wages were down 3% year-over-year despite the lower “inflation” number. June is the second most important month for Japanese as it represents one of the two “bonus months” for payouts, and to stumble that badly for June before figuring any price changes is pretty clear evidence of not only nothing beyond Step 1 for QQE, but that it may actually be harmful beside. So where the Bank of Japan might point to the unemployment rate as some kind of positive economic reflection of their monetary influence, as the Fed and Bernanke so often do, underlying that narrow labor view is all continued decay and rot. Actual labor utilization and output in Japan remains on the decline. 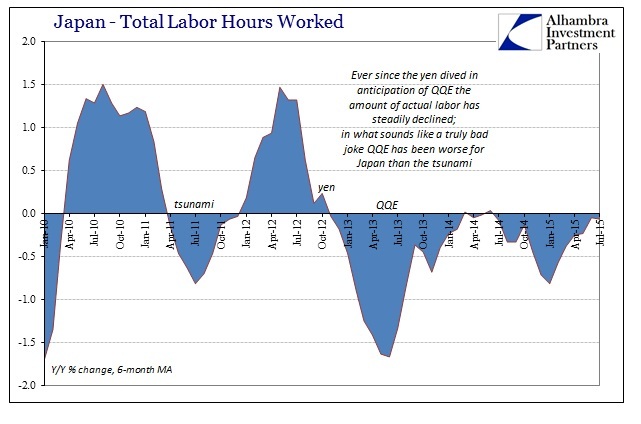 At least when the earthquake and tsunami devastated the Japanese economy in 2011 it was a temporary setback; QQE, on the other hand, has clearly been a more or less permanent, depressive influence. With labor and earned incomes under such strain, it is little wonder “demand” has been continually suppressed. Credit doesn’t even factor. 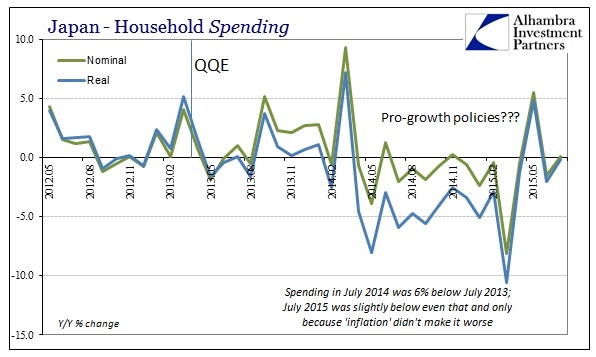 Household spending in July was barely positive (year-over-year) nominally and thus barely negative in real terms (again, “aided” by low “inflation” contrary to stated objectives). That result would be difficult on its own, but when compared to July 2014 it reveals the extent of the ongoing devastation; nominal household spending last July was 2% below July 2013, whereas real household spending was about -6%! To be flat or slightly contracting from last year’s trough is devastating. Given that it has been almost two and a half years now for QQE and the fact that it isn’t possible any longer to ignore or just dismiss (transitory?) this perpetual decay, the Bank of Japan has forced itself into yet another trap – but only one of its own making (yes, it styles the conditions for this trap and then forces itself into it, which is as absurd as it sounds; but that is monetary reality inside the orthodox bubble). Sources say the Bank of Japan has been quietly brainstorming the idea of overhauling its massive monetary stimulus programme over time, casting doubt on officials’ confident assertions that it can keep buying up government bonds for several more years. Sources familiar with the BOJ’s thinking say stepping up its 80 trillion yen ($665 billion) per year asset buying remains its go-to option if deflationary pressures persist, given a limited arsenal of obvious policy alternatives. But they say the central bank isn’t ruling out breaking with the money-printing programme over the longer term, as it has had little success in accelerating inflation toward its 2 percent target since it began in April 2013. “If the medicine isn’t working, you wonder whether it makes sense to keep prescribing more,” one of them said on condition of anonymity. Finally, some appeal toward actual science, using simple and basic observation instead of ridiculous models and regressions that have proven time and again to be useless, at best? Have we finally reached the point of central banks waking up to their fallacies? 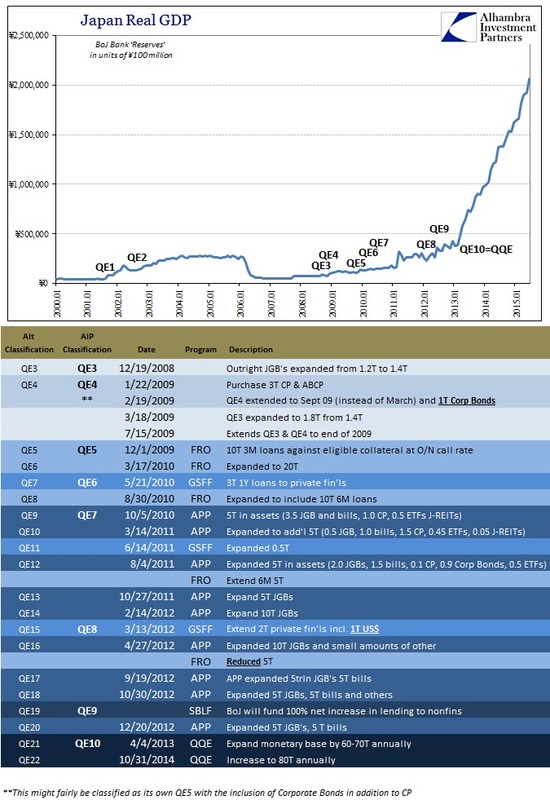 The article quoted above even makes the claim that a former BoJ policymaker actually declared QQE was never meant to “last another five, 10 years.” None of the prior QE’s were, either, so instead “temporary” measures become escalations. Again, the purpose of all of this has been to try to get beyond Step 1; all to no avail. To now add QQE to that dim view should force some serious reckoning and accountability, stripping monetary and even orthodox economic theory back down to its basic philosophies and reconstructing how they are all wrong. This would include, of course, realizing how “money” itself has evolved under the wholesale framework and how that relates to the serial asset bubbles and massive financial imbalances that might themselves be the pathology of turning this monetary “stimulus” into the very depressant thwarting Step 1 in the first place. If the BOJ bumps into trouble buying JGBs, some analysts say it could abandon the 0.1 percent interest the central bank pays on reserves the financial institutions park in BOJ accounts, or even charge a fee for them. That might particularly hurt regional banks, which are already struggling with thin margins on bond investments. “The BOJ can combine this step with an increase of risky asset purchases and call it a new version of QQE,” said Ryutaro Kono, chief Japan economist at BNP Paribas, who was once considered a candidate to fill a BOJ board vacancy. There are no words. After fourteen and a half years of heavy intervention in Step 1, all producing a much smaller and more fragile economy, the “answer” is to go back to Step 1 of Step 1? Japan is a useful analog in so many ways, not just about what the US and global economy can (has already?) become if allowed to follow into this same circle of Hell. It pretty much proves the incapacity of orthodoxists toward anything outside of their so very limited understanding and appreciation. In other words, the global economy is left wholly dependent on only populist revolt.